Past players from various strands of the game have paid tributes to Seán McCaffrey, the former Ireland youth team and Dundalk manager who today passed away at the age of 58. When Brian Kerr left the role of U-17 and U-19 manager for the senior team in 2003, the man he had appointed as the first development officer for the Cavan/Monaghan area four years earlier was chosen for the vacancy. He remained in the post, which also included managing the U-18s and a brief stint as caretaker U-21 boss, until he was sacked by High Performance Director Wim Koevermans in August 2010. The FAI later settled an unfair dismissal action. 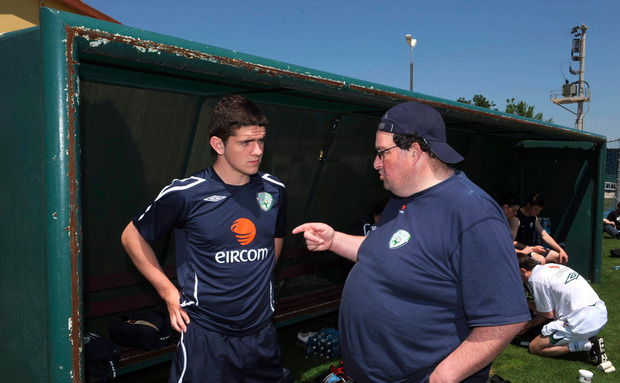 During his time in charge, he led Ireland to the 2008 U-17 European Championships in Turkey with a team containing the likes of full internationals Robbie Brady, Conor Hourihane and Greg Cunningham. Reaching the U-19 finals was a much taller order, given only seven nations qualified, but he went close with teams featuring future stars such as James McCarthy. Of the 14 Ireland players that featured in the last senior game Denmark, over half came through the tutelage of McCaffrey at some stage. They were goalkeeper Darren Randolph, whom he promoted to the U-19s as a 17-year-old, Stephen Ward, Robbie Brady, Jeff Hendrick, Aiden McGeady, Shane Long, Harry Arter and captain David Meyler. His next and final managerial role was a seven-month stint at Dundalk during 2012, eventually being succeeded by current boss Stephen Kenny. Two of the players he brought to Oriel Park, Chris Shields and John Mountney, were part of the club's three-in-a-row title-winning side. Earlier in his life, McCaffrey was a promising player who was recruited by Leicester City only to have his career prematurely curtailed by injury. That didn't curb his zeal for the game as he was a founding member of Monaghan United, becoming the first-team manager at the age of just 23. It was during this time that Kerr came to appreciate the Monaghan native's management and coaching abilities, soon enlisting him to his team of development officers dotted around the country. One of McCaffrey's major legacies is the Cavan underage league, which he helped establish from nothing in 2002. McCaffrey's health problems first became evident as Ireland boss when diabetes forced the amputation of a lower leg in the 2007/8 season. This didn't hamper his contribution, as the U-17s qualified for the Euros in May, but along with kidney issues, it led to ill-health in recent years. He passed away early this morning at Cavan General hospital. West Bromwich Albion's kitman Jacko Smyth, who previously worked in a similar role for the Ireland U-19s, led the tributes. "Shocked to hear of Sean's passing. What a great coach and great man. I had the pleasure to see him work with many future internationals. Enjoyed so many trips in faraway countries," he tweeted. Lots of his former players also heaped praise about their departed coach on social media but one message from League of Ireland stalwart Derek Foran encapsulated his range of attributes. "Sean was an absolute gent of a person. I'll always remember when times were tough at a former club that he offered players money out of his own back pocket to help. A summary of the man he was." A statement from his hometown club read: "It is with regret that Monaghan United has learned of the death of Seán McCaffrey, former Monaghan United and National team manager. Funeral arrangements not yet known. At dheis dé go raibh a anan,"
Seán is survived by his wife Irene and wider family.